Common foot and ankle treatments performed by the podiatrists at Sol Foot and Ankle Centers. 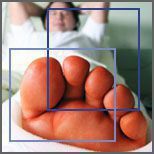 Treatment of skin lesions and toenail trimming: Keep your feet healthy and comfortable with regular check-ups on corns, calluses, and ingrown toenails, nail fungus or thickened toenails. We provide treatment as often as necessary to treat pain caused by these common and frequently recurring foot problems. In most cases treatment is pain-free and patients get immediate relief with safe, effective, and sterile techniques. Permanent correction of ingrown toenails: Ingrown toenails are quite painful and can become a chronic problem. The border of the nail can be removed and the root can be cauterized so that the problem area doesn't grow back. This is called a "matrixectomy" procedure. The procedure leaves no scars and the result is usually cosmetically pleasing. Only the "bad" part of the nail is removed, leaving the rest of the nail whole and healthy. Foot and Ankle Surgery: Our podiatrists have completed rigorous surgical training in the field of podiatric medicine. Common procedures include bunionectomy, hammertoe repair and neuroma surgery, but our doctors also have advanced training in flatfoot reconstruction, foot and ankle trauma, and joint fusion procedures. In addition, Dr. Shirai has ACFAS certification in ankle and small joint arthroscopy. Many uncomplicated surgeries can be performed in our office’s sterile-ready surgical suite. More advanced procedures may have to be performed in a hospital or outpatient surgery center. Injection therapy for immediate pain relief of foot and ankle problems: Our podiatrist's are trained and have the ability to inject the foot and ankle in a safe manner with little to no pain for our patients. Injection therapy has no side effects and gets our patients back on their feet faster. Most patients will progress back to a healthy state after their first injection while some may follow up in a few months. Thorough removal of warts and other skin lesions: Using the most effective and minimally invasive techniques Sol Foot & Ankle Centers provides quick and effective treatment using Verrusol, a medication for plantar warts that removes the warts through blister formation. Follow- up treatments are performed weekly until the condition is resolved. Platelet injection: With a concentrated plasma of platelets, growth factors and cytokines taken from your own sample, this new technique initiates healing in tissue, bone, and cartilage by promoting repair and development of new blood vessels. The procedures involves a collection of whole blood that is anti coagulated with citrate dextrose before undergoing two stages of centrifugation designed to separate the platelet rich plasma aliquot from the platelet-poor plasma and red blood cells. Clinical uses include nerve injury, tendonitis, osteoarthritis, and bone repair and regeneration. Custom foot orthotics are designed not just to conform exactly to the shape of your feet, but to also conform with your lifestyle. We fabricate orthotics to fit any shoe type, including all types of athletic shoes, work shoes and even high heels! 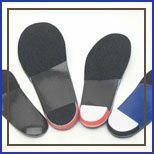 Orthotics can be made for general everyday use or for your specific work, leisure or athletic activities. Custom orthotics offer relief of foot and ankle pain caused by injuries, overuse, arthritis, and many other causes. They can help improve athletic performance, increase endurance, and restore critical balance. Orthotics help your muscles to compensate for imbalances caused by the stress of activity. They help to alleviate postural problems caused by the feet and are often also helpful for knee, hip and back pain. Orthotics molds are created on site by the doctor from either a plaster mold or a 3-D computer image of your feet. Orthotics are created with your foot positioned in its neutral (corrected) position – not standing on a scanner plate like many cheap imitations. All orthotics are fabricated at a PFOLA (Prescription Foot Orthotic Laboratory Association). Orthotic molds can be returned to you and/or stored digitally and can be reused to make new orthotics in the future. Custom orthotics last from 3 to 5 years and maintain most of their original support over the life of the orthotics. Why not store bought, pre-made orthotics? Most pre-made supports break down within 6 months. During the course of those 6 months you are receiving gradually less support with every step you take! Computer scanner plate orthotics are made to relieve pressure, but do not capture your exact foot structure. Pre-made orthotics may save you money initially, but in the long run will cost you more with frequent replacement and less support resulting in more pain and trips to the doctor. Orthotic Modification and Accommodation: Once we create your orthotics, we strive to keep you happy. At Sol Foot and Ankle Centers we are able to to adjust and make shoe and orthotic modifications in-house to keep your feet in tip-top-shape. Whether it's damaged or a worn out orthotic covering we got you covered. Diabetic Foot Care and Shoes: Common foot problems can quickly become serious in diabetic patients. The reasons for this are because many diabetic patients are not able to feel their feet due to nerve damage and patients have abnormal sweat secretion and oil production. This causes sores to develop in areas where the skin may breakdown due to abnormal pressures on the feet while walking. Diabetic patients should seek medical attention to treat these sores. An impaired immune system and damaged blood vessels in a diabetic patient may make it very difficult for these sores to heal. This may cause bacterial infections in the skin, muscle, and eventually even bone. It's important to keep these wounds clean, bandaged, and healing so that this infection does not spread. Spreading of the infection can lead to need for amputation and if the infection leaks into the bloodstream the condition may be life threatening. The best medicine is always prevention. 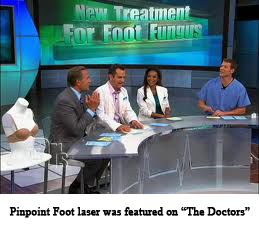 Seek medical treatment before the problems occur to prevent foot complications. We offer advice on how to keep your feet healthy and recognize when symptoms of a problem may arise. Many diabetic patients qualify for special diabetic shoes. Our office carries the newest styles and will take the time to measure and fit your shoes. We can add shoe modifications so that your shoes fit your feet perfectly – removing pressure points, adding extra room where needed, and fixing uncomfortable rubbing. Come on in today and try on a pair in our in-office podiatry and shoe store, Foot Traffik. We can take the “Fun” out of Fun-gus! Treatment of onychomycosis (toenail fungus) is challenging because the infection is embedded within the nail itself and sometimes even the root of the nail. As a result, returning the nail to its normal appearance can be a slow process. We stress a 3-part Process When Treating Toenail Problems. 1. Appropriate diagnosis: There are many causes of abnormal nail growth; the presence of a fungus should be confirmed prior to starting a treatment plan. 2. Appropriate treatment plan: There are at least 4 treatment options for fungal nails including topical treatment, oral medication, nail removal, and laser treatment. We’ll select the best option for you. 3. Recurrence prevention: Once you contract a nail fungus the chance of the problem coming back at some time in your life is very high. There are a variety of new strategies available to prevent recurrence. -Ability to apply nail polish the day after treatment.